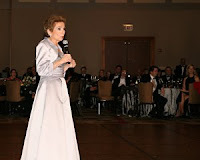 A Silver Lining Foundation (ASLF) raised more than $170,000 this past Saturday, October 3 at the fifth annual A Sterling Event, the foundation's an annual black-tie gala at the Hyatt Regency McCormick Place. Founded by breast cancer survivor and NBCChicago nutrition expert Dr. Sandy Goldberg, ASLF provides breast cancer resources, including treatment options and support services, to uninsured and underinsured patients. Nielsen then presented Goldberg with a $25,000 check on behalf of Jewel-Osco to support the programs of ASLF. Jewel-Osco has supported ASLF in the past by holding events to pre-qualify women in Jewel-Osco stores for no-cost screening mammograms and through generous contributions to ASLF’s Buy A Mom A Mammogram™ program, which funds the mammograms. 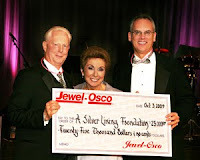 Jewel-Osco’s continued support is appreciated not only by us at A Silver Lining, but by the thousands of patients we have helped in the past and will help in the future.”Underwritten by Robert and Barbara Sherman for the fourth consecutive year, 100 percent of funds raised at the gala, including proceeds from the live auction and silent auction and check from Jewel-Osco, will support ASLF’s three programs. The event drew 300 guests, who enjoyed passed appetizers and cocktails, a live auction and silent auction, vocal stylings of famed cabaret singer Nan Mason, the beats of Rhythym City and the hosting duo of KISS-FM’s Ty Bentli and NBC-5’s Ginger Zee. The energetic live auction was one of the best live auctions in recent Chicago history, led by noted professional auctioneer David Goodman and raising more than $60,000. Coveted packages included once in a lifetime opportunities, like a five-night trip to Hawaii with airfare included; a trip for two to New York’s Spring 2010 Fashion Week; a chauffeur-driven outing to a taping of the “Oprah Winfrey Show,” followed by a private shopping trip at Bloomingdale’s; and a New Year’s trip to a private Tuscan farmhouse in Cortona, Italy. 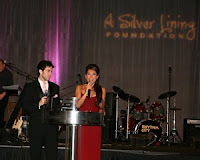 For more information on A Silver Lining Foundation, please visit http://www.asilverliningfoundation.org/ or call (312) 345-1322.